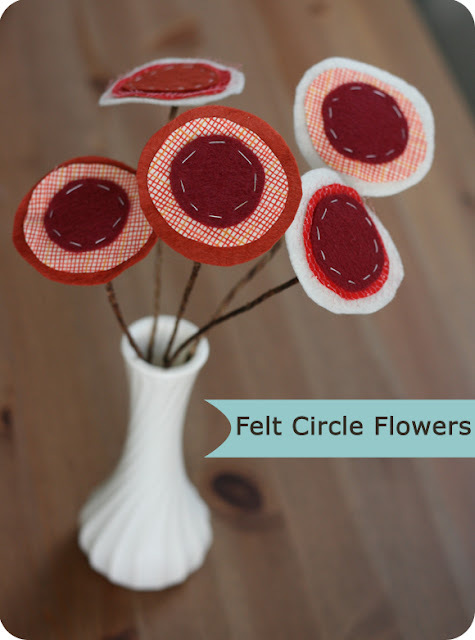 Fabric flowers don't have to complicated. They don't need a lot of complicated twists and folds. Sometimes all you need are a bunch of circles to bright someone's day. Wedding cards have caused me trouble in the past. Up until a few years ago, I had gone to zero weddings so I had little to no experience with the genre. The first few I made were *awful. * Aaaaand then two years ago the weddings began and this year we're attending four so I need to get on my game. I really love cards and I want to be able to create something from the heart for these people I care deeply about. Here is try #1. I think it's a pretty good first effort. The values are all a bit too similar (a common problem of mine) but otherwise, I like the super simple design. Maybe I could add another circle so it's less Happy Engagement! and more Happy Life Together! 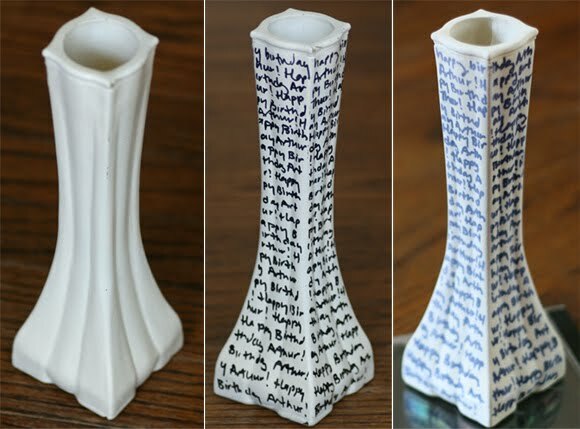 Vase + Facelift = Vaselift! Easter has come and gone already. Can you believe it? From a craft stand point, that means we're in bit of a dry spell...except if you love weddings. Then this is like the super holiday season of weddings. And there are also birthdays. Birthdays are mini holidays sprinkled throughout the year to keep us going. I'm always a day or week late on those celebrations including this year when I made a bouquet of flowers for a friend (photos and tutorial will arrive in a few months for that one :) and needed a vase. Welcome back to Week 3 of 52 Weeks of Paper/Fabric Flowers. This week let's try some Cone Flowers. I call these Cone Flowers b/c they are made up of a bunch of tiny little cones. These were a big hit in my husband's and my wedding flowers. 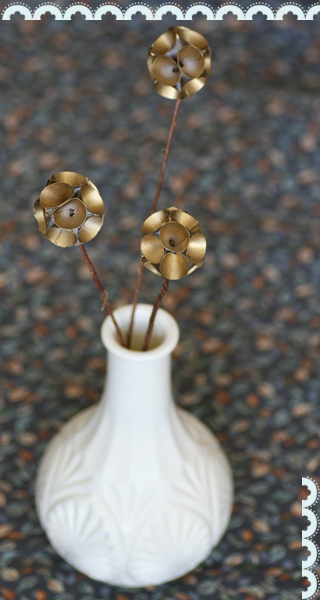 These gold ones here would be very elegant as single flowers in a black and gold wedding or you could make festive pink and white for a bridal shower. What I love about these is that they work as accents. You don't have to make a ton for them to be effective. Let's say you have a live flower bouquet and you need to add an accent of a chartreuse or a pink (or whatever.) Make some of these out of card stock, hit them with appropriately colored spray paint and there you go. Done and done. Easter is this coming weekend! It snuck up unexpectedly but there is still time for the crafty aspects of the holiday. One thing I did this year was pull out my watercolor paper, paints and combined them with some new skills with masking fluid. Cards are a great way to learn new art techniques without the scary expectations of Creating Art. 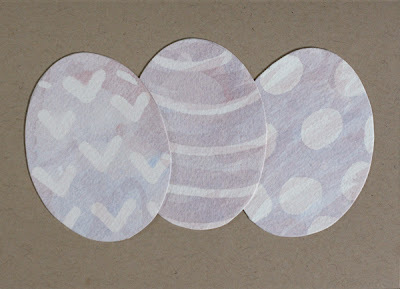 I put the tutorial up at my work blog. Check it out! PS- Everything I learned about masking I learned from the wonderful Linda Baker. I love birthday cards. They can be sweet or funny, quiet or loud. They often have themes like cupcakes and flowers. Who doesn't love cupcakes and flowers? They are also a great excuse to get creative with what you already have laying around your studio. 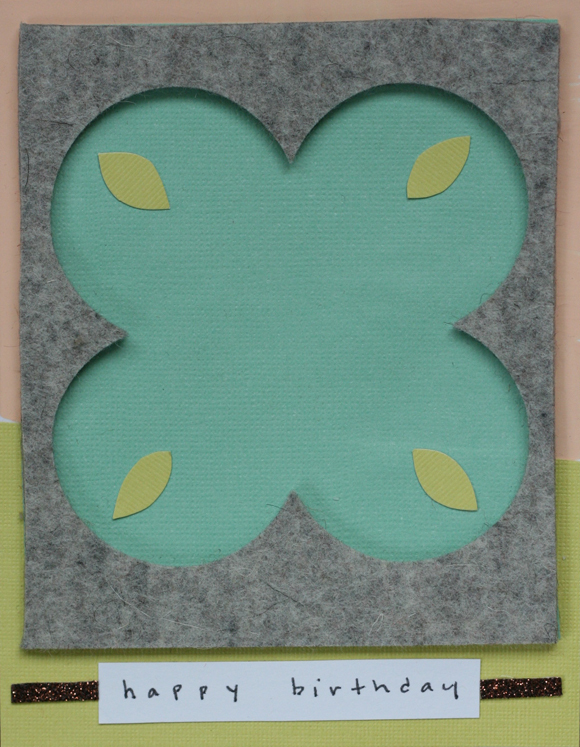 I made this card with a scrap piece of felt I just discovered and paint and paper I had on the desk. I almost couldn't bring myself to add anything over the green and pink background combination. But now I have that tested and approved for something else! I use brown floral wire for almost all of the fabric flowers I make. When I made flower arrangements for my husband's and my wedding, I kept feeling like something was missing. Originally I thought it was the bulk that leaves make. And while, yes, there was some of that, I think a fair amount was the fact that the stems were brown. There's an easy solution no further than the 99 cent paint isle of your local craft store. Paint. 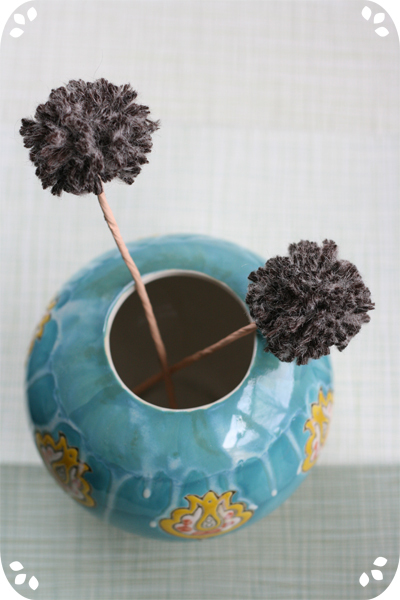 If it's summer and you've got a lot of stems to make, pull out the spray paint. If you don't have a million to make, use paint and a brush. Last week we learned (or reviewed) a Half Tied Pom. 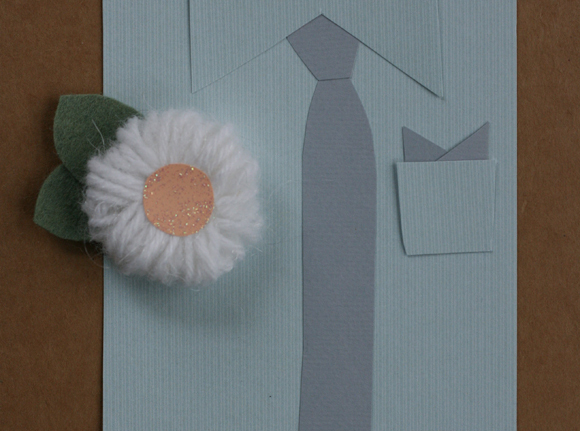 Instead of a stem, I've added two felt leaves, a circle of what could be glitter paper and a pin to make it a boutonniere. This could also be made into a hair clip. Perfect for Easter basket gifts! There was a new edition to my extended family this last week and so this little guy is heading to her in the next couple of days. 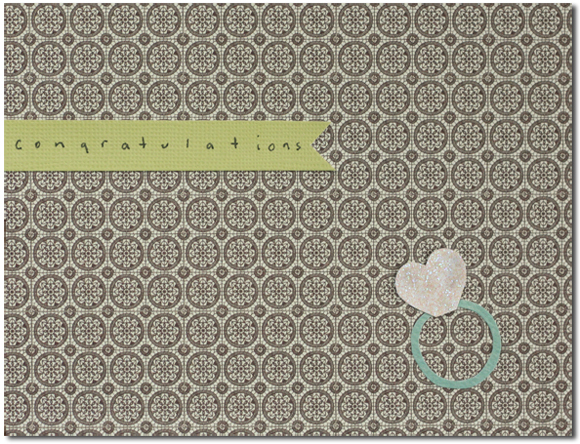 I love the ideas of cards for baby showers and other baby/kid things but rarely have the occasion! These will be showing up in the shop in the next week or so. Poms have been everywhere on the internet. They are magical. 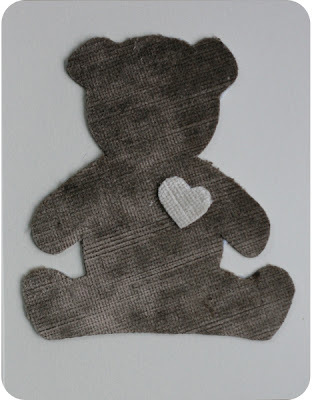 They are furry and cute and you can make them with a ball of yarn, a pair of scissors and a couple of fingers. Pretty magical. So starting out this 52 weeks of fabric flowers; let's revisit the delightful little pom and hang out with her little sister the half tied pom. If you find yourself saying, "What's a pom?" Well, watch the video after the jump. 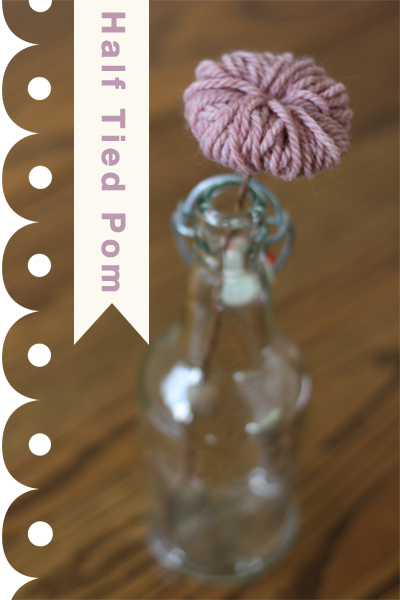 If you know the pom, let me introduce you to the half tied pom. The half tied gets its name because it's a pom but you stop earlier in the process. Note: In the video I show you how to put a stem on after you've clipped the flower. After making dozens of these, I learned a very useful tip. Glue the stem on when the flower is in a half tied pom stage. Cut after the glue has dried. This makes adding the stem infinitely more easy. Why do more work than you need if you can get a basic start? This is why I love the bunny head from circle. 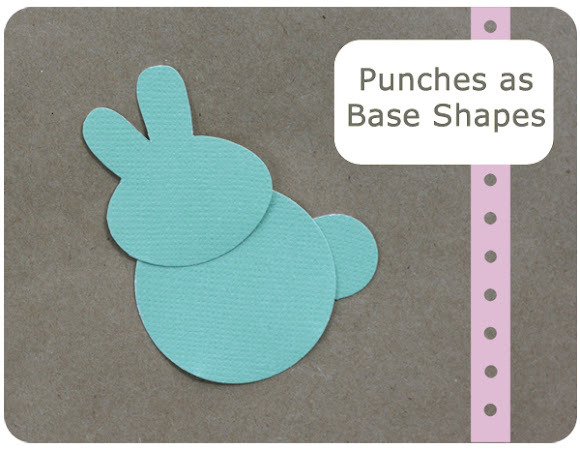 Yes, you could just cut out the head shape, but the punch gives you a great place to start. I have a tendency to be inspired by products in a store. When we were filming Sherrill Kahn, she mentioned that product inspires her creativity. It wasn't until that moment that I realized that I am the same way. I walk through a craft store and say Sherrill's fantastic phrase, "What if?" Sound familiar? But sometimes I look around my studio and am aware of how much stuff I own. Also sound familiar? 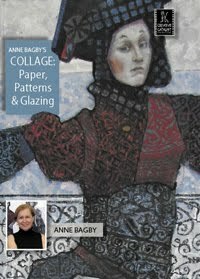 I bought light molding paste when I was learning the techniques in Ann Baldwin's second DVD, "Text & Texture in Mixed Media Collage," which I love. But then the light molding paste sort of sat until I looked at a stack of Goodwill bound craft supplies. I heard Sherrill's phrase, "What if?" again. This is how Paste Cards were born. They are wonderfully filled with texture and the graphic silhouette that is in so much of my work. 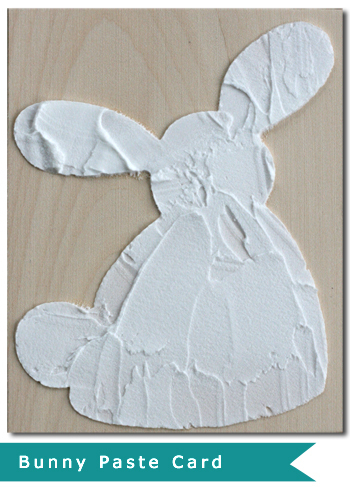 The light molding paste is fun to use and the possibilities are limitless. Enjoy!